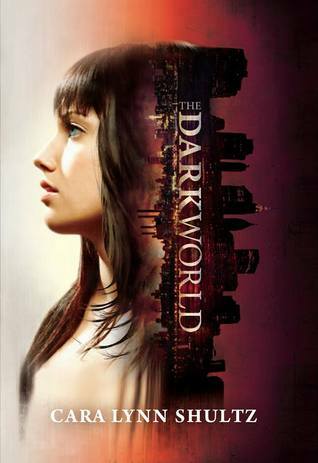 I finished reading The Dark World about a week ago, but every time that I have sat down to write a review for it, I get hung up. I try to be eloquent and write a perfectly worded review but it doesn't end up quite as elegant as, say..... jumbled. Eloquent just isn't my thing, so here is a very Jaime review. I was super excited about The Dark World and when I received a copy for review, there may have been dancing and a little bit of singing. I started immediately, and immediately I was drawn to Paige. She has a fantastic, dark and sarcastic voice that I loved. She has a hard time at school, she is constantly ridiculed and bullied. Yet, while it hurts her, she still holds her head high and holds her own against the mean girls. She was a great character. The introduction to Dottie, her dead BFF, was fantastic and I just knew that this story was going to be awesome (sauce). Awesome (sauce) it was not, unfortunately. The worst part about it is that it could have been. The potential was all there, but it fell short for one big reason. I shall commence to explain. The Dark World is a world that mirrors ours, but is darker(um, obviously Jaime) with terrible creatures and demons living and fighting there. That is where Dottie comes from, and later another character Travis. Logan is a new student in school, and Paige has a bit of a crush on him but thinks there isn't a chance he would go for her, the girl nicknamed Bellevue Kelly. Paige is attacked one day in the girls bathroom by a new girl in school, and the new girl starts to change, but she is interrupted and runs. That afternoon, in detention, she is attacked again when Logan comes in, brandishing a sword, and saves her. This is where it falls apart, for me. Paige wants Logan to teach her to defend herself, so he begins giving her lessons. Lo and behold, what do you think happens? They fall in love, of course! Now, don't get me wrong, I love a good romance. But when I read a synopsis and it talks about THE DARK WORLD and demons and warlocks, by golly THOSE are the things I want. Unfortunately, the romance ended up being pretty much the focus of the story for most of the book. Yes, there were a couple of good fight scenes, and some interactions with the evil ones, but not nearly enough for my liking. So, alas, I was disappointed. I don't want to end this on a bad note, so I will leave you with a few good things. If the love story had not become the biggest focus of the story, it would have been a good one. Both Paige and Logan were great characters, and the romance was very cute and sweet. ( A little insta-lovey, but still cute). Finally, the ending left me with a great amount of hope that what I wanted so badly in this first book, I may get in the next one. So, not one of the best books, but certainly not terrible. I would absolutely recommend that you give it a shot. There are definitely plenty of redeeming factors in this story, my issue with it stems solely from my own expectations. Cara Lynn Schultz is a fantastic writer and she has a great way with her characters. I will definitely be reading book 2, and hopefully enjoying a lot more of The Dark World. Oh, oh and oh..... I cannot finish this review without mentioning the AMAZING cover! Fan-freakin-tastic! You know, after reading the blurb, I can see why it and the title would give you certain expectations. I wonder if the blurb had a more true to manuscript feel, if the expectations could have been better set and you could have enjoyed it much more? I think that I might have enjoyed it more if the blurb had been more true to the story. Absolutely, I think that is true! I still don't think that I would have loved it, because romance really isn't my thing, but I would have had a more enjoyable experience!